When I think of Fall I think of apple trees and apple cider and my mom's warm apple crisp. We actually never make it apple picking but I do love to find other simple apple themed activities to do with my kids. 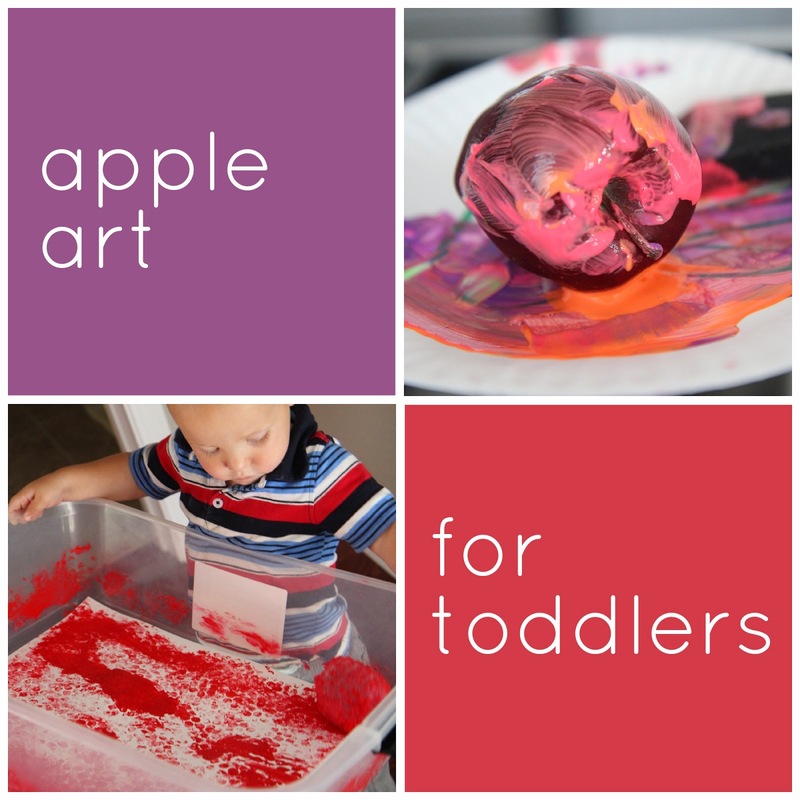 Last week we tried two favorite activities and gave them an apple themed twist. We thought the experience was a whole lot of fun! It was so fun in fact that my toddler had a huge tantrum when we had to put the activity away to pick up my oldest son. I would call that a success! The first activity we adapted was marble painting and we turned it into Apple Pop Painting! To start off you need to cut your paper to fit your box or tub and then place it in the bottom. Then you need to wrap an apple with bubble wrap and secure it in place with tape. Once you do that you might want to let your kids have fun just rolling it around and exploring the apple with bubble wrap. It feels pretty cool and it is fun to listen to the pops as you press the apple down. After that roll the bubble wrapped apple in some paint and then place it onto the paper in the large tub. Next just grab the sides of the tubs and start rolling the bubble wrapped apple back and forth. It will make some pretty cool marks on the paper. You can also turn this into a mess free project by putting the lid back on the tub. My toddler was NOT a fan of this version and prefered to help move the apple around by touching it from time to time. Once we were done I had grand intentions of cutting the dried red painted paper into large apples but then I decided that the experience was so fun that I didn't need to make anything cutesy with the remnant paper. We will definitely be trying this one again! Just like we paint pumpkins in the Fall I thought instead of doing apple stamping with the inside of the apples that we'd try just painting on the outside of the apples. I set out the materials and my preschooler and toddler went to town mixing colors and decorating their apple. This activity is super easy! We just squirted out some paint onto our palette and my kids started painting their apples! They were both fascinated by this project! As I mentioned over the weekend, we are huge fans of simple activities for toddlers. These two apple activities are definitely simple! If you missed my latest post you might enjoy these 10 quick and easy toddler activities too.